Are you ready to become more beautiful while enjoying your beauty sleep? 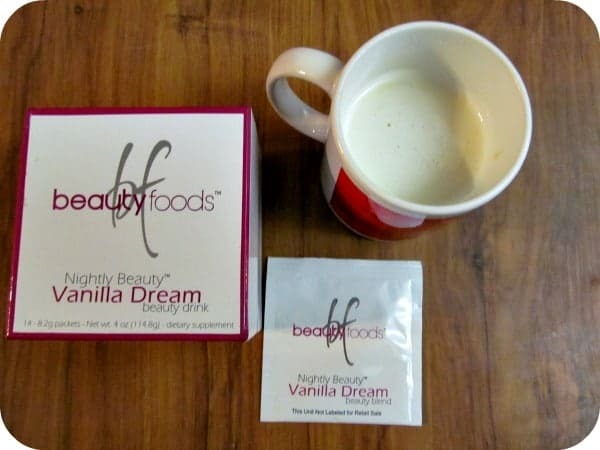 Nightly Beauty™ by Beauty Foods is a “beauty drink” that was created to help you go to sleep and feed your skin with natural ingredients and collagen technology. There are three flavors to indulge in including Chocolate Bliss, Chocolate-Chai Renewal and Vanilla Dream. I tried the Vanilla Dream emptying the individual packet into a cup of hot milk. I swirl the delicious powder into the milk whipping it into a frothy drink and then I enjoy the relaxing aroma of vanilla while lounging in bed with a good book. In about 30 minutes, I am ready for a good night rest. It has a rich, creamy taste that is truly relaxing. It includes vitamins A, C, E, B6, B12, Thiamin, Riboflavin, Biotin, minerals and AlphaWave™ L-Theanine & Calming Blend along with a Collagen blend. What is AlphaWave™ Calming Blend? It is a blend of chamomile flower, lemon balm leaf, passion flower, hops and valerian root extract. I appreciate that it only has 30 calories, 7 carbs and 3 grams of sugar while boasting 3 grams of fiber. 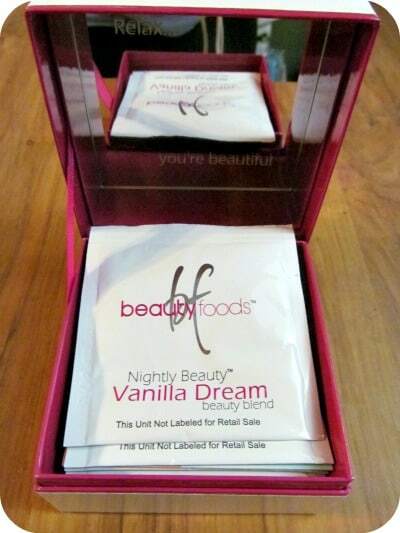 Nightly Beauty™ by Beauty Foods is a wonderful indulgence for yourself and a great gift idea for the holidays, new moms or as a bridal shower gift. Each super stylish box of Nightly Beauty™ is meant to be reused and includes 14 8.2 gram packets and is available for purchase for $49.99 and refills are only $34.99. You can save even more by selecting auto ship for FREE shipping and 10% off your order! chocolate chai renewal blend is what i’d like to try. I think the Chocolate Bliss would be great to try! This is a really interesting product… I’d love to try the Chocolate Chai Renewal Beauty Blend. Love anything chai. Chocolate Bliss Beauty Blend sounds amazing! I’d do vanilla, I am not a chocolate girl! I learned that it contains vitamin B, vit C, vit E and A, Biotin and Magnesium. I WOULD START WITH THE VANILLA DREAM, IT JUST SOUNDS NICE-THANKS! I like that they are all natural. I would love to try the Chocolate Chai Beauty Blend. I would like to try the Chocolate Bliss. Goodness and pleasure all together! I would love to try the Chocolate Chai Renewal Beauty Blend. I would want to try the Chocolate Chai. A flavour I’d like to try is the vanilla dream. I’m not much of a chocolate drink gal, but vanilla is a fav of mine. I learned that this can help you fall asleep. I love the thought of “beautiful chocolate”! I’d love the Chocolate Bliss flavor. I like that it Promotes relaxation & restorative sleep that is really important because I have Fibromyalgia and it is important for me to get my sleep. I would love to try the Chocolate Chai Renewal Beauty Blend. It sounds delicious. I would love to try the Chocolate Bliss Beauty Blend!